Click the image above for your free flyer! Can’t Get to Game On 13? We’ll come to you. You read that correctly. 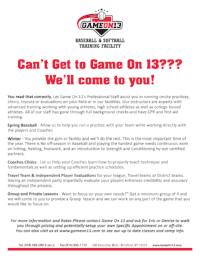 Let Game On 13’s Professional Staff assist you in running onsite practices, clinics, tryouts or evaluations on your field or in our facilities. Our instructors are experts with advanced training working with young athletes, high school athletes as well as college bound athletes. All of our staff has gone through full background checks and have CPR and first aid training. You provide the gym or facility and we’ll do the rest. This is the most important time of the year. There is No off-season in Baseball and playing the hardest game needs continuous work on hitting, fielding, footwork, and an introduction to Strength and Conditioning by our certified partners. Let us Help your Coaches learn how to properly teach technique and fundamentals as well as setting up efficient practice schedules. Travel Team & Independent Player Evaluations for your league, Travel teams or District teams. Having an independent party impartially evaluate your players enhances credibility and accuracy throughout the process. Want to focus on your own needs? Get a minimum group of 4 and we will come to you to provide a Group lesson and we can work on any part of the game that you would like to focus on. For more information and rates contact us today.